Are you craving some late night tacos after a crazy night out? Check out our list of the 5 best places to satisfy all your taco needs. Front of the La Pasadita Taqueria. Dont forget to get your best Mexican car insurance when driving down to Mexico! These tacos are not as well known as other tacos shops in Rosarito but that doesn’t make them any less tasty. 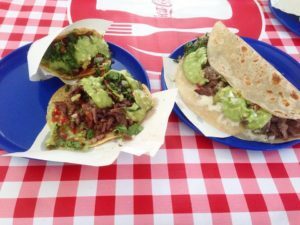 The secret behind this place is their corn tortillas, freshly made at the moment with a super plump and soft consistency. The quality of the beef is also something else and the adobada tacos are extremely good in here. Don’t forget to try the adobada corn quesadillas over here! They are located next to Reubens social club near the Ortegas restaurant but on the opposite side of the boulevard. Tacos La Araña has made a reputation for themselves because of their amazingly seasoned beef and delicious handmade tortillas. For some people these are the best corn tacos in town, these tacos have become a tradition in Rosarito. They are located on the libre road heading towards Tijuana at the northern part of Rosarito. Flour quesadillas with beef and lots of guacamole! Well, who hasn’t heard about this taco shop? This is not your traditional Mexican taco. 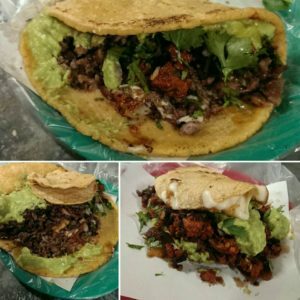 The corn tacos we know are called “Tacos poblanos” because they are prepared like this in the central state of Puebla and migrants have brought their taco style to the northern part of Mexico. Tacos el Yaqui, on the other hand, are traditional tacos from the northern state of Sonora. In Mexico, the northern states tend to use more flour tortillas and a higher quality of meat in their tacos. The main taco here is the taco “Perron” which is a flour quesadilla with delicious chunks of marinated thick beef. 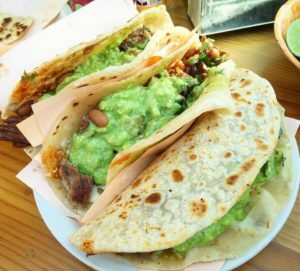 These tacos are a must for any newbie coming to Rosarito!. They are conveniently located going up the streets in front of the festival plaza. 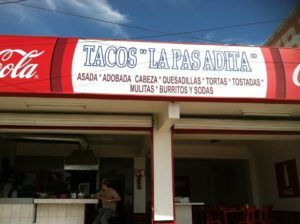 Probably the most famous tacos in Rosarito as they were the first ones to open shop in Rosarito. They have maintained the quality throughout the years. Adobada, suadero, tripa and carne asada are a must in here. Also, the corn quesadillas with any kind of meats are off the charts. This tacos located right next to Le Cousteau (French restaurant) has also some amazing corn tortilla. 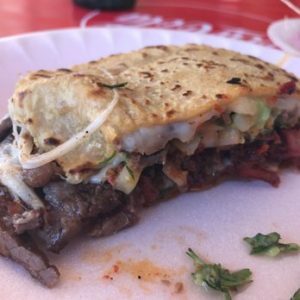 The adobada corn or flour quesadillas are extremely good and satisfying. A favorite taco shop for all the people that want to end they’re crazy nights with a variety of feel-good tacos! So there you have this 5 extremely good taquerias that we are sure will become a designated stop for anyone driving down to Rosarito. To get to any of this taco shops just use google maps or Waze and don’t forget that your US car insurance does not cover in Mexico, we offer the best Mexican car insurance directly from our easy to use website. So if driving down to Mexico don’t forget about Bajascape for all your Mexican car insurance needs. Discover Bajascape…The best Mexican car insurance online! Cabo Pulmo, the marine paradise for divers. Previous story Looking for the best Mexican car insurance at the border? BajaScape © 2019. All Rights Reserved.